It's almost like even he has no idea what's going on. Nobody expected miracles in Clint Bowen’s first game as Kansas Jayhawks head football coach. Which is good, because there weren’t any. Unless you count scoring two touchdowns a miracle, and considering the KU offense, it might well be one. This week, the Hawks are back at home taking on Oklahoma State (Saturday, 3pm CT, Fox Sports One). The most interesting thing Coach Bowen has said all week concerns the quarterback situation. 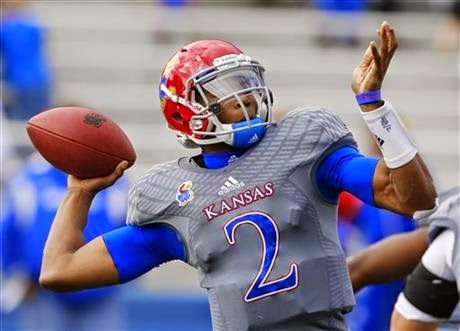 Montell Cozart isn’t the worst QB ever, he’s just stuck in a situation where he can’t succeed. How much of that is his fault? Anyway, in his presser, Bowen said that nobody freaks out when other positions shuttle players in and out, so why should quarterback be any different? The answer, coach, is that the quarterback controls everything that goes on in the offense. When you have three different bosses, you have three times as many problems. Nice try, though. We get the message loud and clear: you’re changing quarterbacks. Probably several times. A game. The Cowboys are the first ranked team KU plays this season, they’re 16th. Their only loss was to number-one Florida State in the first game of the year. They’re 4-1, 2-0 in conference. Against non-ranked “big 5” conference opponents (Duke, Texas, and West Virginia), KU is 0-3, being outscored 97-17. This is not a good sign. The only thing that might- might, as in real big longshot- help KU is that this is OSU’s first real road game of the year. The FSU match officially occurred on a neutral field, at the Jerry Jones Memorial Mausoleum in Dallas. So the Kansas crowd, if anyone’s still left, could possibly maybe potentially throw the Cowboys off. Somewhat. Oh, the game starts at the same time as the second game of the American League Championship Series between Kansas City and Baltimore. 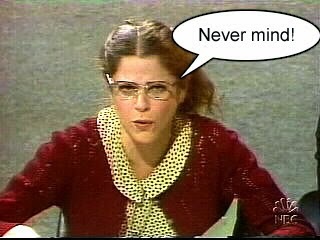 As the great Emily Litella said…. Sorry, Julie. Almost forgot about you.